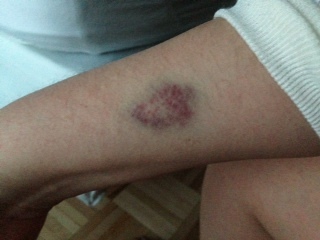 I had a bunch of blood work done at the Ottawa Hospital yesterday, about 30 hours ago, and I still have a wallop of a bruise on my arm, left over from one of the sticks. Everyone was really nice, but unfortunately the lab people weren’t quite as talented as Roy, Terry and Sonia back at Cedars…getting stuck 16 times by 3 different people is a new record for me (the last record, was 8 times, in the Cedars ER when I first got really sick back in the fall of 2005). I guess the important this is, I got all the bloodwork done…everyone felt very bad about it…I just kept reminding them I know it’s not their fault. I really am a super hard stick..